1950 Chevrolet Styleline Deluxe 2dr OFFERS? 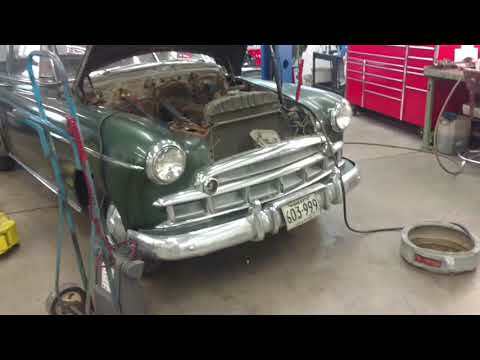 Here is a 1950 Chevrolet Styleline Deluxe 2dr that has been 1 family has owned it since it was new. The original interior is still in this car and it does show some wear. The car just came out of storage and does run and drive with an external gas can as a fuel source. Take a look at pics of the underside and you'll see it still has the original floors in it . The frame shows some surface rust but you can tell by looking it's not all rotted like many you'll see that have been sitting out in the grass or dirt. The paint does show it's age and have some patina to it, but still looks very period correct for a 1950 Chevy. The owners felt it was time to find this car a new home so it could be enjoyed again. Yes, we are aware the car has a 1949 grille in it. This particular car would make a nice running driving project for somebody that wants to take it to the next level or with a little TLC you could just make it your Sunday cruiser for the summer. Have any questions or like to know more call Jeff, Jay or Landon at 507-386-1726 or email "sales@uniquemankato.com" ALL TRADES AND OFFERS WILL BE CONSIDERED!